Telescoping boom stand, holds two mics. 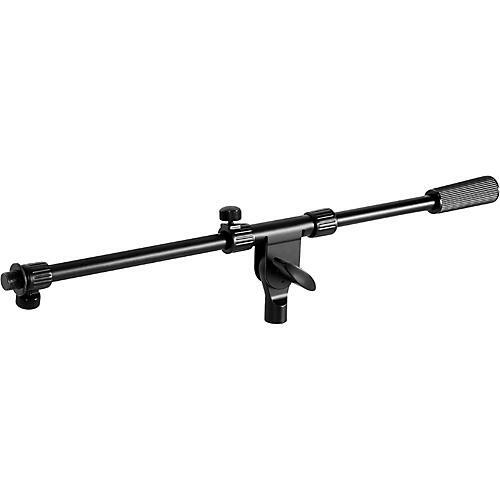 The MSA9800 Microphone Tele-boom with Dual Mic Capability is a pro-level boom arm with solid steel construction, secure metal knobs and black powder-coated finish. The length adjusts from 21.5 – 36" and the cats-eye knob easily adjusts angle positions. The MSA9800’s unique functionality allows you the option to remove the counterweight and add a second mic to the opposing 5/8"-27 threaded end, providing space-saving versatility on the road or in the studio. Reconfigure your approach to tele-boom utility.